Swedish award for "outstanding contribution to music"
Pink Floyd were awarded the 2008 Polar Music Prize yesterday by Sweden's King Carl XVI Gustaf during a ceremony yesterday. Band members Nick Mason and Roger Waters accepted their award on behalf of the group. Swedish Prime Minister Fredrik Reinfeldt said the British rock band had made "a monumental contribution and captured the mood and spirit of a whole generation in their reflections and attitudes." The audience gave the prize winners a standing ovation when they arrived to receive the awards - American soprano Renee Flemingwas also honored - each worth $157,700. The ceremony was held in the Stockholm Concert Hall. 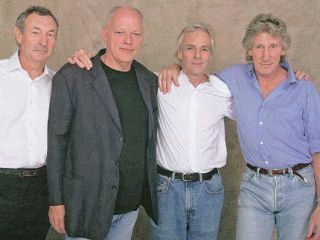 Pink Floyd, founded in the mid 1960s, reached critical acclaim and popularity with albums such as Ummagumma, The Dark Side Of The Moon and The Wall. Nick Mason, 63, said the band was honored to receive the award and that fellow band members David Gilmour and Richard Wright were sorry they couldn't attend. Roger Waters , 65, paid tribute to his 96-year old mother. "If there is any humanity and empathy in my work, which I think there is, I would rather owe it to her," he said. Swedish artists performed the band's songs at the ceremony, ending with a sing-along to the hit Another Brick In The Wall. Reinfeldt recalled playing the song - which has the memorable lyric, "We don't need no education" - on his school's loudspeakers when he was 14. The Polar Music Prize is Sweden's biggest music award and is usually split between pop artists and classical musicians. No word yet on what Pink Floyd plan to do with the prize money, but last we heard, they don't really need it.